NRS Raft Frames are the result of a dynamic evolution that began in 1972. Experimental research, thousands of river hours and heeding valuable advice from customers have been the keys to our success. Over the years, frame manufacturers have utilized materials such as wood, conduit, PVC pipe and steel tubing in the quest for a frame that is strong, lightweight and performance-ready. The NRS solution is top-grade aluminum-alloy pipe, our exclusive heavy-duty cast aluminum LoPro™ fittings and custom-made stainless steel U-bolts. Combining these components with superior design has produced the world’s leading, fully adjustable and customizable frames. NRS Raft Frames assemble easily and quickly, forming a solid, stable rowing platform. Breaking down a frame for transport or retrofitting a gear frame into a sport-rowing frame is only possible because of the NRS modular design. Whether you are loading up a bush plane for an outback adventure, or storing your frame in an apartment closet, the sleek and simple design will accommodate just about any need. These strong and durable frames are made to be maintenance-free, rust-free and good for a lifetime of boating. NRS has exactly what you need and want in a frame. With multiple sizes and complete adjustability, NRS frames will fit any raft and adapt to rowers of all types and sizes. An NRS frame is fully customizable to be the frame you need it to be, in the environment you need it for. NRS offers quality assurance and a fully backed lifetime warranty. We offer you premium frames at value pricing, supported by the experience of 40+ years of outstanding customer service. Your frame should be as wide as or wider than your boat's center-to-center measurement. Determine the center-to-center measurement by measuring the width of your boat and subtracting the diameter of one main tube (C = W - D) (see diagram above). Order your frame that width or wider. The maximum length of your side rails is determined by the available flat area on your side tubes. The wear patch material usually extends the distance of the flat area. 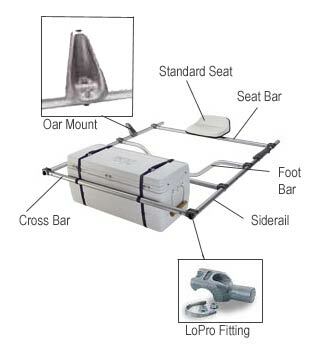 Most boaters purchase the longest side rail length possible to maximize the useful area of their frame. 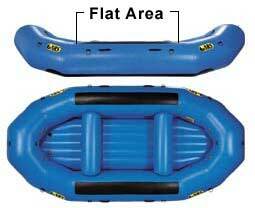 NRS boat frames can be made to fit any inflatable raft or cataraft. We pride ourselves on making the most versatile inflatable boat frames available anywhere. If you have questions or special frame needs just give us a call at 877.677.4327.